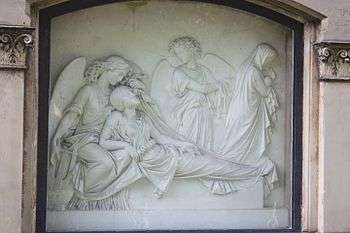 Maternal death is defined by the World Health Organization (WHO) as "the death of a woman while pregnant or within 42 days of termination of pregnancy, irrespective of the duration and site of the pregnancy, from any cause related to or aggravated by the pregnancy or its management but not from accidental or incidental causes." The world mortality rate has declined 45% since 1990, but still every day 800 women die from pregnancy or childbirth related causes. According to the United Nations Population Fund (UNFPA) this is equivalent to "about one woman every two minutes and for every woman who dies, 20 or 30 encounter complications with serious or long-lasting consequences. Most of these deaths and injuries are entirely preventable." UNFPA estimated that 289,000 women died of pregnancy or childbirth related causes in 2013. These causes range from severe bleeding to obstructed labour, all of which have highly effective interventions . As women have gained access to family planning and skilled birth attendance with backup emergency obstetric care, the global maternal mortality ratio has fallen from 380 maternal deaths per 100,000 live births in 1990 to 210 deaths per 100,000 live births in 2013, and many countries halved their maternal death rates in the last 10 years. Worldwide mortality rates have been decreasing in modern age . High rates still exist, particularly in impoverished communities with over 85% living in Africa and Southern Asia. The effect of a mother's death results in vulnerable families and their infants, if they survive childbirth, are more likely to die before reaching their second birthday. Factors that increase maternal death can be direct or indirect. Generally, there is a distinction between a direct maternal death that is the result of a complication of the pregnancy, delivery, or management of the two, and an indirect maternal death. that is a pregnancy-related death in a patient with a preexisting or newly developed health problem unrelated to pregnancy. Fatalities during but unrelated to a pregnancy are termed accidental, incidental, or nonobstetrical maternal deaths. The most common causes are postpartum bleeding (15%), complications from unsafe abortion (15%), hypertensive disorders of pregnancy (10%), postpartum infections (8%), and obstructed labour (6%). Other causes include blood clots (3%) and pre-existing conditions (28%). Indirect causes are malaria, anaemia, HIV/AIDS, and cardiovascular disease, all of which may complicate pregnancy or be aggravated by it . Sociodemographic factors such as age, access to resources and income level are significant indicators of maternal outcomes. Young mothers face higher risks of complications and death during pregnancy than older mothers, especially adolescents aged 15 years or younger. Adolescents have higher risks for postpartum hemorrhage, puerperal endometritis, operative vaginal delivery, episiotomy, low birth weight, preterm delivery, and small-for-gestational-age infants, all of which can lead to maternal death. Structural support and family support influences maternal outcomes . Furthermore, social disadvantage and social isolation adversely affects maternal health which can lead to increases in maternal death. Additionally, lack of access to skilled medical care during childbirth, the travel distance to the nearest clinic to receive proper care, number of prior births, barriers to accessing prenatal medical care and poor infrastructure all increase maternal deaths. Unsafe abortion is another major cause of maternal death. According to the World Health Organization, every eight minutes a woman dies from complications arising from unsafe abortions. Complications include hemorrhage, infection, sepsis and genital trauma. Globally, preventable deaths from improperly performed procedures constitute 13% of maternal mortality, and 25% or more in some countries where maternal mortality from other causes is relatively low, making unsafe abortion the leading single cause of maternal mortality worldwide. 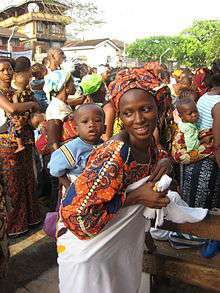 At a country level, India (19% or 56,000) and Nigeria (14% or 40,000) accounted for roughly one third of the maternal deaths in 2010 . Democratic Republic of the Congo, Pakistan, Sudan, Indonesia, Ethiopia, United Republic of Tanzania, Bangladesh and Afghanistan comprised between 3 and 5 percent of maternal deaths each. These ten countries combined accounted for 60% of all the maternal deaths in 2010 according to the United Nations Population Fund report. Countries with the lowest maternal deaths were Estonia, Greece and Singapore. In the United States, the maternal death rate averaged 9.1 maternal deaths per 100,000 live births during the years 1979–1986, but then rose rapidly to 14 per 100,000 in 2000 and 17.8 per 100,000 in 2009. In 2013 the rate was 18.5 deaths per 100,000 live births, with some 800 maternal deaths reported. The death rate for women giving birth plummeted in the twentieth century. The historical level of maternal deaths is probably around 1 in 100 births. Mortality rates reached very high levels in maternity institutions in the 1800s, sometimes climbing to 40 percent of birthgiving women (see Historical mortality rates of puerperal fever). At the beginning of the 1900s, maternal death rates were around 1 in 100 for live births. Currently, there are an estimated 275,000 maternal deaths each year. Public health, technological and policy approaches are steps that can be taken to drastically reduce the global maternal death burden. Most maternal deaths are avoidable, as the health-care solutions to prevent or manage complications are well known. Improving access to antenatal care in pregnancy, skilled care during childbirth, and care and support in the weeks after childbirth will reduce maternal deaths significantly . It is particularly important that all births be attended by skilled health professionals, as timely management and treatment can make the difference between life and death. To improve maternal health, barriers that limit access to quality maternal health services must be identified and addressed at all levels of the health system. Recommendations for reducing maternal mortality include access to health care, access to family planning services, and emergency obstetric care, funding and intrapartum care. Reduction in unnecessary obstetric surgery has also been suggested. The biggest global policy initiative for maternal health came from the United Nations' Millennium Declaration which created the Millennium Development Goals. The fifth goal of the United Nations' Millennium Development Goals (MDGs) initiative is to reduce the maternal mortality rate by three quarters between 1990 and 2015 and to achieve universal access to reproductive health by 2015. Trends through 2010 can be viewed in a report written jointly by the WHO, UNICEF, UNFPA, and the World Bank. Maternal deaths and disabilities are leading contributors in women's disease burden with an estimated 275,000 women killed each year in childbirth and pregnancy worldwide. In 2011, there were approximately 273,500 maternal deaths (uncertainty range, 256,300 to 291,700). Forty-five percent of postpartum deaths occur within 24 hours. Ninety-nine percent of maternal deaths occur in developing countries. ↑ "Health statistics and information systems: Maternal mortality ratio (per 100 000 live births)". World Health Organization. Retrieved June 17, 2016. 1 2 3 4 5 6 7 "Maternal health". United Nations Population Fund. Retrieved 2016-03-22. ↑ Khlat, M. & Ronsmans, C. (2009). "Deaths Attributable to Childbearing in Matlab, Bangladesh: Indirect Causes of Maternal Mortality Questioned" (PDF). American Journal Of Epidemiology. 151 (3): 300–306. 1 2 "Maternal mortality: Fact sheet N°348". World Health Organization. WHO. Retrieved 20 June 2014. ↑ The commonest causes of anaemia are poor nutrition, iron, and other micronutrient deficiencies, which are in addition to malaria, hookworm, and schistosomiasis (2005 WHO report p45). 1 2 Conde-Agudelo A, Belizan JM, Lammers C (2004). "Maternal-perinatal morbidity and mortality associated with adolescent pregnancy in Latin America: Cross-sectional study". American Journal of Obstetrics and Gynecology. 192 (2): 342–349. doi:10.1016/j.ajog.2004.10.593. PMID 15695970. ↑ Morgan, K. J. & Eastwood, J. G. (2014). "Social determinants of maternal self-rated health in South Western Sydney, Australia". BMC Research Notes. 7 (1): 1–12. doi:10.1186/1756-0500-7-51. PMC 3899616 . PMID 24447371. ↑ Haddad, L. B. & Nour, N. M. (2009). "Unsafe abortion: unnecessary maternal mortality". Reviews in obstetrics and gynecology. 2 (2): 122. PMC 2709326 . PMID 19609407. ↑ Dixon-Mueller, Ruth; Germain, Adrienne (1 January 2007). "Fertility Regulation and Reproductive Health in the Millennium Development Goals: The Search for a Perfect Indicator". Am J Public Health. 97 (1): 45–51. doi:10.2105/AJPH.2005.068056. PMC 1716248 . PMID 16571693 – via PubMed Central. 1 2 3 "MME Info". maternalmortalitydata.org. Archived from the original on October 14, 2013. ↑ Lee, K. S.; Park, S. C.; Khoshnood, B.; Hsieh, H. L. & Mittendorf, R. (1997). 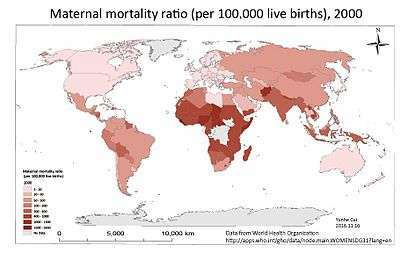 "Human development index as a predictor of infant and maternal mortality rates". The Journal of Pediatrics. 131 (3): 430–433. doi:10.1016/S0022-3476(97)80070-4. PMID 9329421. ↑ "Comparison: Maternal Mortality Rate". The World Factbook. Central Intelligence Agency. ↑ Atrash HK, Koonin LM, Lawson HW, Franks AL, Smith JC (1990). "Maternal Mortality in the United States". Obstetrics and Gynecology. Centers for Disease Control. 76 (6): 1055–1060. PMID 2234713. ↑ "Pregnancy Mortality Surveillance System - Pregnancy - Reproductive Health". CDC. ↑ Morello, Carol (May 2, 2014). "Maternal deaths in childbirth rise in the U.S.". Washington Post. ↑ "WHO Maternal Health". WHO. ↑ Wang W, Alva S, Wang S, Fort A (2011). "Levels and trends in the use of maternal health services in developing countries" (PDF). Calverton, MD: ICF Macro. p. 85. (DHS Comparative Reports 26). ↑ Lu, M. C. & Halfon, N. (2003). "Racial and ethnic disparities in birth outcomes: a life-course perspective". Maternal and child health journal. 7 (1): 13–30. doi:10.1023/A:1022537516969. PMID 12710797. ↑ See, for instance, mortality rates at the Dublin Maternity Hospital 1784–1849. 1 2 Marge Koblinsky; Mahbub Elahi Chowdhury; Allisyn Moran; Carine Ronsmans (2012). "Maternal Morbidity and Disability and Their Consequences: Neglected Agenda in Maternal Health". J Health Popul Nutr. 30 (2): 124–130. JSTOR 23500057. PMC 3397324 . PMID 22838155. ↑ Sayeba Akhter; FCPS; DRH; FICMCH; et al. (2003). "Use of a Condom to Control Massive Postpartum Hemorrhage" (PDF). Medscape general medicine. 5 (3): 38. ↑ "Reducing Maternal Mortality" (PDF). UNFPA. Retrieved September 1, 2016. ↑ Costello, A; Azad K; Barnett S (2006). "An alternative study to reduce maternal mortality". The Lancet. 368 (9546): 1477–1479. doi:10.1016/S0140-6736(06)69388-4. ↑ "MDG 5: improve maternal health". WHO. May 2015. Retrieved September 1, 2016. ↑ "Trends in Maternal Mortality: 1990 to 2010" (PDF). WHO, UNICEF, UNFPA, and the World bank. Retrieved 22 April 2014. ↑ Chambers, V.; Booth, D. (2012). "Delivering maternal health: why is Rwanda doing better than Malawi, Niger and Uganda?" (Briefing Paper). Overseas Development Institute. ↑ "Development assistance for health by health focus area (Global), 1990-2009, interactive treemap". Institute for Health Metrics and Evaluation. Archived from the original on 2014-03-17. ↑ "Progress in maternal and child mortality by country, age, and year (Global), 1990-2011". Archived from the original on 2014-03-17. ↑ Bhutta, Z. A.; Black, R. E. (2013). "Global Maternal, Newborn, and Child Health — So Near and Yet So Far". New England Journal of Medicine. 369 (23): 2226–2235. doi:10.1056/NEJMra1111853. ↑ Nour NM (2008). "An Introduction to Maternal Mortality". Reviews in Ob Gyn. 1 (2): 77–81. PMC 2505173 . PMID 18769668. Maternal Mortality in Central Asia, Central Asia Health Review (CAHR), 2 June 2008. Confidential Enquiry into Maternal and Child Health (CEMACH) - UK triennial enquiry into "Why Mothers Die"
Save A Mother Non-profit focused on MMR reduction. W4 Non-profit that supports mothers and their children to reduce maternal and infant mortality through safe births.